That goes a long way in explaining why Miliband is increasingly shifting from an anti-austerity message to a campaign that places greater funding for an increasingly burdened National Health Service (NHS) at the heart of his bid to defeat Cameron in eight months’ time. 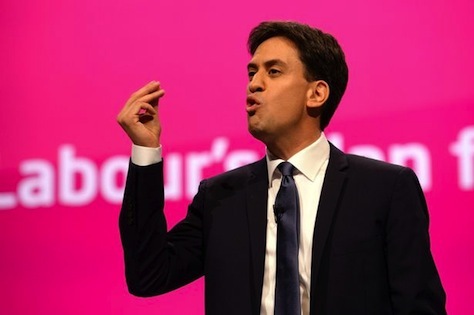 Accordingly, in his speech to the Labour faithful in Manchester yesterday, Miliband pledged to deliver an additional £2.5 billion in funding to the NHS, designed to add 20,000 more nurses, 8,000 extra general practicioners, 5,000 careworkers and 3,000 midwives. To avoid taunts from Cameron and Osborne that Labour would simply borrow more money to pay for additional NHS funding, Miliband announced his plan to raise a ‘time to care’ fund to pay for it all, which will include raising £1 billion from tax avoidance, including closing loopholes used by hedge funds, the introduction of a new tax on houses worth more than £2 million, and more taxes on British tobacco companies. Pivoting off the success of the ‘Better Together’ campaign in last week’s Scottish referendum, Miliband used the word ‘together’ over 50 times in his speech, spinning easy slogans about how the Tories will leave British voters ‘on their own,’ and that only Labour can introduce truly nation-building policies. As easy as it might be to attack hedge funds, cigarette-makers and wealthy homeowners at a Labour conference, Miliband’s latest maneuver demonstrates two strategic decisions. First, he believes that championing health care is a better path to 10 Downing Street than savaging the fiscal decisions of the past four years. Secondly, Miliband also believes that Labour, in particular, is still vulnerable to attacks that it was fiscally irresponsible during the Blair-Brown years. That may or may not be true, but Miliband’s fears reflect the reality that voters, especially in Middle England, don’t entirely trust Labour as frugal enough. (Never mind that Brown led the international response, beginning with his decision to nationalize Northern Rock, to prevent the 2008-09 crisis from turning into the 21st century equivalent of the Great Depression. Though Miliband, in a 67-minute speech delivered without notes, discussed immigration and devolution, and he further called for extending voting rights to 16- and 17-year-old voters, he didn’t convey in any compelling way that he understands the fierce cultural underpinnings of the immigration and English devolution issues. Nor did he especially demonstrate that he understands the motivations that led 45% of the Scottish electorate to support a permanent split from the United Kingdom last Thursday. Never mind his reticence on EU matters, including his opposition to holding a 2017 referendum on British membership in the European Union. Or his hesitation in discussing a British military role, alongside US and Arab allies, in attacking the Islamic State group that now controls much of eastern Syria and northern and western Iraq. Miliband’s most difficult problem, however, might not have a policy solution at all. That’s because there’s still a nagging worry that Miliband doesn’t convincingly play the role of prime minister. It’s a charge that both allies and enemies have leveled since 2010 against Miliband, who at age 44 is just three years younger than Cameron and the same age as Blair when Labour won its landslide victory in 1997. Maybe it’s because he looks so much younger, or geekier, than Cameron, or maybe it’s because he always suffered from an experience and gravitas gap in comparison with his brother David. When he hit his stride, he was like a star Harvard lecturer. As he introduced Elizabeth, the apprentice, you might have been watching an infomercial presented by Michael Sandel. As an analyst, Miliband is persuasive. But this is the trouble. The job he is applying for is not to describe the country’s problems but to fix them. And it’s in that latter regard that he does not quite convince. Miliband doesn’t want to be Britain’s senior tutor but its prime minister. With just eight months to go, he doesn’t yet look the part.